I had a blog post partly completed and was hoping to complete it today (Wednesday) whilst hubby was out at work, the universe it seems had other plans. I should add that the universe usually does. I can’t think straight to complete the post and as it is on a complex topic, I want to get it right and not publish something that is below my own standards. The reason behind my inability to use the partly completed post is that last night I had a bad fall, a very bad fall. I faint quite a bit I am used to waking up on the floor. I suffered a faint a few weeks ago. I was arising from the toilet (after urinating), I was standing one minute and then I wasn’t, I was falling to the floor. Everything went black but I was still aware of my surroundings as I was still conscious and knew I had to avoid hard surfaces such as the sink. I managed to get my arms out to break my fall and lay on the bathroom floor groaning for a few moments. My husband raced in and found me with my jeans around my ankles and my naked arse sticking up in the air. Not the most dignified way to be discovered and I am grateful a) that we didn’t have guests and b) that this had not happened in a public toilet. Last nights fall was completely different, I didn’t faint it was just a simple accident. It happened so quickly or simply I was only semi conscious as I made my way to the bathroom that I just didn’t have time to react. One minute I was standing, the next my right foot was crashing into the bathroom cupboard and my left leg was twisting behind me whilst bouncing off the bathroom door. The sound of me crashing to the ground was so loud not only did it wake my husband but also my next door neighbour. It was pitch black as I hadn’t bothered to turn the light on as I normally feel my way along the banister the occupational therapist had recommended we had fitted. There is also the night-light in the hall which means I don’t wake hubby up when I make my frequent trips to the bathroom overnight. I think I almost gave hubby a heart attack, being woken from deep sleep by a loud crash is never pleasant. I could hear him shouting to me and asking if I was alright but I couldn’t reply. I was hurting all over so badly that all I could do was groan. In his panic to reach me he ended up falling over his treadmill, so now two of us were injured. On arriving at the scene of my latest disaster he asked ” where does it hurt”, “all over” I hissed back at him. I couldn’t move because my left leg was twisted behind me pinning me in the door frame. There have only been a few times in life I have thanked my lucky stars that I have Ehlers Danlos syndrome and last night was one of them. I was thankful that I am so flexible I knew my leg that was in a silly position like a circus contortionist would be fine just sore. 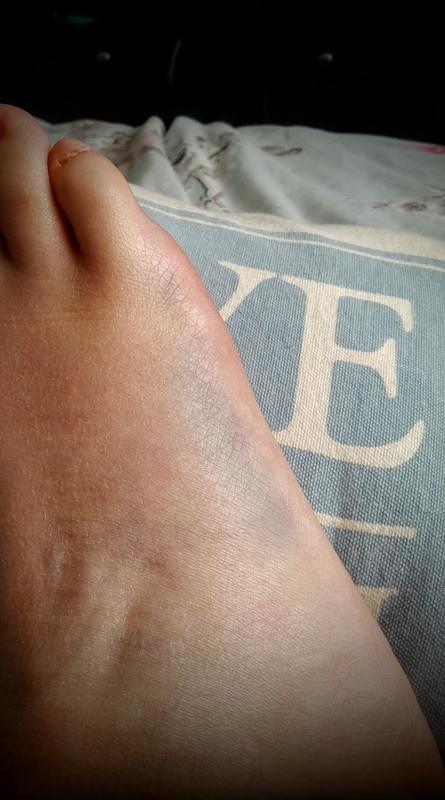 I was more concerned about my right foot as although it was only moments after I had slipped and fallen, it was swelling, with a deep blue bruise forming from the base of my little toe, down the outside of my foot. Gingerly hubby helped me extricate myself from the door frame, I had to crawl forwards to reach my shower stool, so that I could haul myself up. I hurt but was surprised it didn’t hurt as much as I thought I would. I think the adrenaline must have kicked in because I decided I would go downstairs and have a cigarette before returning to bed. Hubby accompanied me to ensure I was safe, once disaster strikes once in our house we tend to have a run of it. I made it back to bed, laid down and then the pain started. My foot was throbbing with every beat of my heart and my left knee was stinging. I checked my knee and I had taken some skin off, despite wearing pyjama bottoms, no biggy. My foot pain increased and I ended up wedging a pillow under it, to raise it up to try to attempt to stop the swelling in its tracks. I then after about half an hour managed to drop off. I woke up at 4am with every area of my body screaming at me. I could barely put weight on my foot and my left knee was disagreeable to be bent. I knew it was going to hurt I just wasn’t prepared for how much. I took my breakthrough painkillers and went back to sleep about an hour later. When I woke up at 8am today the pain wasn’t too bad, stupidly I thought that was all that was going to hurt. I can safely say now 5 hours later that the only part of me that isn’t hurting is my ribcage on the right side. As the day had progressed the bruises have started to come out. I am so sore that I can not do anything without squeaking. Although now I can bend my knee and put weight on my foot it is extremely uncomfortable. I am also exhausted with it all. It couldn’t have come at a worse time as we are having friends over for our annual BBQ. I have a list of jobs for both hubby and I to do that is a mile long and now today I can’t do anything. It’s so silly that a simple slip can land you in so much hot water. Just when you think things have turned the corner something else happens to throw a spanner in the works! Today I will mainly be having a “I am feeling sorry for myself day”. The bruise on my right foot which is still developing and hurting like hell! Things go wrong, they always seem to go wrong given half the chance but the amount of stuff that went wrong yesterday (Tuesday) would have tried the patience of a saint. It seemed as if disaster was lurking around every corner. Ok so it was technically nothing serious, other than a potential fire and things could have been much worse. It was just a very, very trying day which thankfully now I am able to laugh about. Tuesday started off very much like any other day, it is my husbands day off in the week, three out of four weeks, so there were jobs planned for him. Whilst I waited for him to wake up, I settled down on the sofa watching the TV and mentally planning out all the tasks that needed to be achieved whilst he was home. I have started a new medication for my inner ear woes, which as yet I can’t order on-line as it isn’t on my repeat medication list as yet. I have to take it three times a day and so far it seems to be working. My ears have been popping like crazy which I can only assume is the fluid draining from them and although I have still had attacks of dizziness they aren’t as severe as when I wasn’t on it. So with medication getting low I sent hubby to the doctor’s surgery to get a repeat prescription request done. This was where I made my first mistake, to make life easier I decided to give him the box of medication – with the last few tablets inside. Looking back I know that this was inviting disaster but I just thought, well actually I couldn’t be bothered to write out all the information when it was all there on the box. An hour later hubby returned home and told me the errands he completed for me. As we sat at the back door having a cigarette, he cheerfully announced “oh and I threw the empty box away.” He was so proud of himself for completing all the jobs but all I could do was stare at him in horror. I tried really hard not to fly off the handle, I knew that part of this was my fault for giving him the box with medication still in it. It was hard but I thought ok this can easily be remedied and I will just ring the surgery and explain what had happened. Well what a silly assumption to make, that the doctor’s surgery would want to help. It seemed like they were deliberately trying to be obstructive. I wouldn’t have minded but Betahistine is not a controlled drug like Morphine. As a receptionist or a member of the prescribing team, I would be far more suspicious of someone who claimed their husband had thrown away their morphine than Betahistine. It took 4 phone calls and repeatedly explaining what the drug was used for to get the people at the end of the phone to see sense. Then after telling them hubby would go and pick the prescription up they faxed it through to a local pharmacy! Thankfully it was the usual one and hubby hadn’t set off for the doctor’s surgery. As hubby was home yesterday it was our big washing day, so his sheets needed doing along with his pj’s. How they hadn’t marched downstairs under their own steam I have no idea. I love clean bedding and if I win the lottery I shall employ a housekeeper to ensure I have fresh bed linen every night. Hubby doesn’t seem to enjoy fresh sheets as much as I do. Moments after he came home from running errands and announcing he had so helpfully thrown the “empty box away”, I opened the washing machine door to find a scene which can only really be described as carnage! I should have turned around and gone to bed there and then, looking back I wish I had. I said “oh no!” really loudly to which hubby replied “what am I being blamed for now?”. I explained to him it appeared a whole box of tissues had been put in the washing machine to which he tried to tell me it couldn’t possibly be his fault. It really wasn’t his day, firstly he was the one who had loaded the machine and secondly his was the only stuff in there. As I trawled through the damp washing trying to remove as much of the tissue as possible our kitchen floor started to resemble a snowy Christmas scene. I then found his pyjama bottoms with the offending tissue shredded to pieces in the pocket. Having been met with his “what am I being blamed for now?” statement, I showed him the pocket of his PJ bottoms. Hubby is suffering from dreadful hayfever at the moment and although he normally uses handkerchiefs, he does on occasion use tissues. He went very quiet on seeing the evidence, I didn’t do a victory lap as I knew he already felt bad about mistakenly throwing away my medication and I knew that had been a combination of errors on both our parts. I did however make him stop hoovering the lounge so he could hoover out the pocket of his PJ’s – yes it was that bad only a hoover would get it clean. I know you are probably reading this and thinking, it isn’t that bad, sounds like a normal day in my house. We are used to things going awry, it seems to be a family curse, it’s just not good when it happens all in one day. On the scale of things they aren’t bad things to happen, just deeply frustrating and if it had just stopped there I could have coped. Things had just gone wrong from the minute I got out of bed. It was only 11:30am and on top of these events I had already hyper-extended my knee backwards (so was limping) and had my hand rolled cigarette unravel dropping a burning piece of ash on my forearm causing a blister. The day had not been kind to me and I would have to wait until 7pm until I could run and hide under my duvet! Hubby was now in a very grouchy mood, he doesn’t respond well to events like this and blames himself for them. Ok the tissue in the pocket was his fault but the medication being thrown away was both our faults. To keep the peace I agreed to watch some TV with him as there are a number of programmes that we watch together. Hannibal season 3 had started and we had still yet to watch it. We managed to get through that hour uneventfully and we had a break from the tv for a bit. After I had showered and dressed we decided we would catch up with Wayward Pines which are both really enjoying. About halfway through the first episode we were watching my Next delivery arrived (Next is a shop in the UK). I took the delivery into the kitchen and unpacked it on top of the ceramic hob (stove top). We have limited space in the kitchen and this was the only place that was clear and clean. I checked over my order and decided I would try the bras on later, so I kept the packaging etc on the stove top. I know huge mistake, we do put stuff on the hob but tend to move it very quickly. We will be going back to that practice after what happened next. An hour or so later I was sat at the back door when I smelt burning. I immediately turned to the cooker to see the orange light on telling me that a ring on the hob was on. As I looked I saw a glimmer of a flame and a spiral of black grey smoke. I raced across the room grabbed the burning bra and scissors that had partly melted onto the hobs surface and threw them in the sink. Hubby came racing in from the lounge to find out what all the shrieking about only to find me using a kitchen utensil to scrape the hob clean from melted bra and scissors. All I can really say is thank goodness I was in the kitchen when the small fire started. I dread to think how bad it could have become if no one had noticed it. I was obviously gutted that I had been so stupid and that I had thrown away money by setting the brand new bra on fire. Luckily that was the only thing that was damaged beyond repair. I have to say how remarkably fire retardant Next bras are, if that is any comfort to anyone. As soon as I could I went to bed as I realised no harm could come to me there. I seriously needed a do over! I have never ever had a day like it. It seems odd writing about this but for the last 12 years I have been haunted by a building. No I am not losing my mind, the building in question was my home from 1996-2003. It was the first place that I lived, after leaving home at the age of 22 and for some strange reason it is as if this building is calling me back. The building in which my flat (apartment) was contained, was formerly a convent school ,The Convent of the Holy Family, which until today I didn’t realise housed boarders as well. I believed that the school had been a normal day school, where the children return home at night. It is only after several hours of hunting on the Internet that I found out that the school took in boarders, girls from the age of 3 years old. Some of the children were also adopted by American families. My little bit of research has been a real eye opener. In the link above I can see my old flat, top left of the building, which was the old chapel for the convent school. It seems so strange to see it in the photograph from the 1930’s as even when it was converted into flats very little was changed on the exterior. I don’t know why this building haunts me so. Maybe it is because this was my home before I became ill? It would certainly be completely unsuitable for me to live in now, with 30 stairs to reach our front door and no lift. It had stunning views of the Exe Estuary, Star Cross and Powderham Castle. On a good day you could see the roof of Exeter Cathedral. It was a beautiful if not compact place to live. It was not without its problems, they started as soon as I moved in. Things would go missing only to turn up in the strangest places. I would return home from work to find the radio blaring despite leaving it switched off when I left earlier that day. Everyone said what a lovely, peaceful atmosphere the flat had and on the whole it did. It was my sanctuary after work, where I had a boss who made it clear I wasn’t his first choice for the position that I had been promoted to. Moving away from family and friends to a strange town and new job has to be one of the most stressful things I have ever done. I am happy now, hubby and I have carved a life out for ourselves, next year I have lived in this town for 20 years. I will always be considered an outsider by the locals but I no longer feel that Plymouth is my home. Plymouth is quite alien to me now, I love the relaxed gentle atmosphere of Exmouth. If you are sceptical of the supernatural or events that can not be easily explained away I suggest you stop reading now. These events occurred whilst I lived in the flat alone and when my husband joined me in 1998 increased further. The fact that so much happened, which we didn’t really talk about until we moved to our new home seems quite unbelievable to me now. Since we moved out of the flat no one has managed to live in it as long as we did. The couple that moved in after us only lasted a year before splitting up and selling it on. Since then I have regularly seen it advertised in the local paper for sale. It has mainly been bought as a holiday home as many of the flats were at the time when we lived there. The first major event I remember happening in the flat and one I can’t explain was in December 1996. I was wrapping Christmas presents and whilst doing so was watching Apollo 13 on video. I wasn’t paying full attention to the film and was lost in the task. I remember looking up and seeing a black and white film on the TV screen. It took a few seconds to register that this wasn’t Apollo 13, as I reached for the video remote control the TV started flicking through the channels. Some may try to explain this away as a resident in the building having the same TV or video as my own however at the time I was the only person who lived in the block of 6 flats. The rest had been sold as holiday homes or were still waiting to be sold. How I didn’t lose the plot and become frightened I don’t know. I did think it was weird but I just put the video back on and started back on the job of getting my families Christmas presents wrapped. As the months went on and before hubby moved in with me in 1998 more things started happening. Whatever was in the flat with me liked to turn off the alarm on my clock radio causing me to be late for work on more than one occasion. At the time I thought I must be turning the alarm off in my sleep. I moved the alarm clock to the other end of the bedroom but almost daily the alarm would be switched off. Only I had the keys to the flat and it seems a bit of a pointless prank to play on someone. In the end I had to resort to setting the alarm on my home phone. At the time the telephone company had a service called alarm call. You could set the phone to ring at the time you wanted to be woken up. This solved the problem of the alarm being turned off. I would like to add I have never sleep walked in my life and I have never turned alarms off in my sleep since leaving the flat. This phenomenon only ever happened there. Whenever I was alone in my flat and that was quite a bit until hubby moved in, there was a constant feeling of being watched. If you have never felt this feeling it is difficult to relay to you. The only way I can describe the feeling is when you have your back turned in a room and someone comes in, without making a sound, you sense their presence in the room. You just know that someone is there behind you. I had this feeling constantly and would turn around quite frightened (as I wasn’t expecting anyone else to be in the flat), there was no one there. I can’t explain it but again this has never happened to either my husband or I since leaving the flat. Our new home has a completely different atmosphere and we are very happy here. I can’t remember the dates of when things happened as there were just so many odd occurrences. Several times a week hubby and I would be woken up in the middle of the night with the TV switched on and it flicking furiously through the channels. The TV remote was always placed on top of the television when we turned it off at night. Neither of us were scared by the weird goings on more bemused by it. One of the weirdest things that ever happened was on a warm summers day, we had all the windows wide open (they were huge windows around 6 ft in length) and suddenly we could hear singing. We couldn’t make out the words but we knew it was some kind of religious music. We looked out of the windows to see if there were a group of religious people marking out the parish boundaries as we had seen them do this before, yet there was no one. The music was coming from the centre of our lounge, the old chapel. We put our ears to the floorboards, nothing, we put our ears to the wall of the adjoining flat, nothing. My husband even left the building and couldn’t hear the music. The music was emanating from our lounge yet we had no explanation for it. It had us perplexed and no sooner had it started it stopped. It was only when we moved into our current home, that we really talked about all the strange things that had happened there. At least when we lost things now we really could go back to the last place we remembered seeing it. In the flat the missing item could turn up weeks later in the middle of the coffee table as if it had been there all along. We and whatever shared our living space tolerated each other. Which after nearly 12 years of not living there I am at a loss as to why this place haunts my dreams. Even now after all these years, I can tell you the layout of each room perfectly. This flat has haunted my dreams ever since we left it. During the day I have no urge to go back and visit it. We’ve pulled up in the car park a couple of times and looked at it from the outside but from the day we handed over the keys to its new owners we have not been back inside. Yet in my dreams I am inside the flat. On some occasions I have sneaked inside whilst the new owners are away, other times I am back living there. The recurrent theme of these dreams is that I have left something behind, some object but even in the dream I do not know what the item is. Over the last week this flat has really invaded my head space, I am thinking of it constantly yet I am clueless as to why. It is almost as if I am drawn to it subconsciously, I have never had this before. My parents home that I left to move into the flat never haunted me this way. Sometimes when I wake from a postprandial episode I think I am back at my parents home other times I can think I am back at the flat. It is just so weird. I have no desire to go back there, I like sharing my living space with entities I can see. I certainly could not handle the steps and could not go back to living without a garden of my own. I know now looking back I was showing signs of my illness even back then. In 1999-2000 I started fainting with no warning. I have a lovely scar on my left leg from where I fell onto concrete, as I fainted in the car park of the flats. That is my one and only souvenir. I know that we left nothing of significance at the flat because in all these years I have never missed it. I would love to know what my subconscious is searching for. What is the hold that this previous dwelling has over me. I have discussed my dreams with my husband, he doesn’t recall having any dreams about the flat. It seems to be only me that is effected by them. I wish this place would stop haunting my dreams, its been almost 12 years now and its time to let go. I am suffering from illness induced writers block. I don’t want to post apologising yet again for there not being a post. It has happened far too often this year already. I know it can’t be helped but if I can’t achieve just one blog post a week where as for the majority of last year I was posting on Mondays and Thursday’s, it feels like a pretty poor show. My health is crazy this year, just one new symptom after another. I tend to write my blog posts on Saturday’s when hubby is at work so I can work in peace and quiet without being disturbed by my hubby shouting at his latest PS4 game because it’s not going well or being asked to “look at that” usually a sporting event. My husband will watch any sport on TV. I swear if they made an Olympic sport out of watching paint dry he would watch it! However things as usual didn’t go to plan, Saturday was a complete wash out. In the morning I had been feeling a little dizzy and very tired. I put it down to low blood pressure. I drank loads, lay on the sofa watching The Tudors (I really enjoyed that and watched all the seasons in a week!) hoping it would pass. It didn’t it only got worse. Sunday I felt ok but my parents had made it up to their caravan and it was the first time I had seen my mum since her operation. So Sunday was not a productive day writing wise either. I was still stuck for a topic and my mind was a complete blank. Monday was the first day of my husbands holiday leave from work, as I was supposed to be being admitted to hospital and he was taking time off to look after the dogs. At 8:15 Monday morning I found out through a friend that the ward was closed due to infection and they weren’t admitting anyone. I was over the moon, I know I am supposed to be getting tests done but I was feeling really lousy and hospital was the last place I wanted to be. I wasn’t ill enough to be in hospital and all I wanted was my own bed. So I had yet another reprieve and I could write my blog post on Tuesday but I was still without a topic and I was starting to get slightly stressed about it. Tuesday I rang the hospital just to confirm I wasn’t being admitted and that was correct. So I decided I would charge up the old chromebook and try to think of a topic whilst it was on charge. Well that plan back fired too. I started getting weird spinning sensations. I can only say it was very much like having drunk too much, the whole room span for a second and then stopped. My heart sank as this was how it had started on Saturday. Over the course of the morning the spinning sensations got closer together until there was no break in them. I downed some Stugeron, my go to medicine when I am dizzy but they did nothing. I soldiered on but it just made me feel increasingly ill by 5pm I took to my bed. So we come to Wednesday, the day before my blog post is published and all I can think is what bloody blog post? There is no blog post written. I have no topic springing to mind, I have writers block, I am still feeling crap from yesterdays attack. I am feeling pretty sorry for myself and I am panicking as there is nothing ready for Thursday. The deadline is looming, this has never happened before. I am feeling so sorry for myself I called the doctor’s surgery and managed to get an appointment straight away! I avoid going to the doctors as much as possible. I can manage most of my conditions at home the majority of the time. I only go when something is happening that is out of my control and I don’t have answers for. So today I saw a locum doctor at the practice and explained the problems I have been having with my ears and how disabling the attacks of dizziness are. I had already researched Menieres disease as it runs in my family and told her from what I had read my attacks are text-book – which for me to have a condition that is text-book is quite unusual! She agreed with me and has requested me for an ENT Consultant referral. Of course all of this gets me no closer to my goal of a topic for my blog post and I hesitate to admit it but I do still have writers block. I simply have zero ideas on that front, so I have bored you all to death with the events of my life! Then at the doctor’s appointment something weird happened. The doctor was very through going through all my notes, she turned to me and asked how my Myasthenia was. I nearly fell off the chair, I replied “Myasthenia?” and she said “yes it says on your notes you have been diagnosed with Myasthenia, how often do you see your neurologist?”. I said “the story that could be told about that diagnosis is far too long for a ten minute consultation and you are already running half an hour late. It basically depends on what doctor I see as to whether I have Myasthenia or not. When I take mestinon my ptosis and stroke like symptoms disappear. ” I left it at that, in shock however that the diagnosis of MG which I had been told had been removed, was still on my records. So that is either an administrative mistake or they are covering their arses. Regardless I still have writers block!